Santa Claus may be the ruby-cheeked patron of the holiday spirit in the United States, but in other countries, he’s often accompanied by helpers of all kinds, who can quite frequently be terrifying. The Krampus of Central Europe is one example that comes to mind—a demonic spirit bound by St. Nicholas to kidnap naughty children and beat them with branches. But as far as creepy Christmas monsters go, Iceland’s Jólakötturinn is by far the most fashion-forward. For most kids who celebrate Christmas, new clothes probably sit just above lumps of coal on the good present scale. But according to an Icelandic tradition, getting new socks before Christmas might just save your life. That’s because of the Jólakötturinn, or Yule Cat, eats anyone who hasn’t received new clothes by the time Christmas rolls around. The story of the Jólakötturinn likely dates back to the Dark Ages, though the oldest written accounts are from the 19th century. 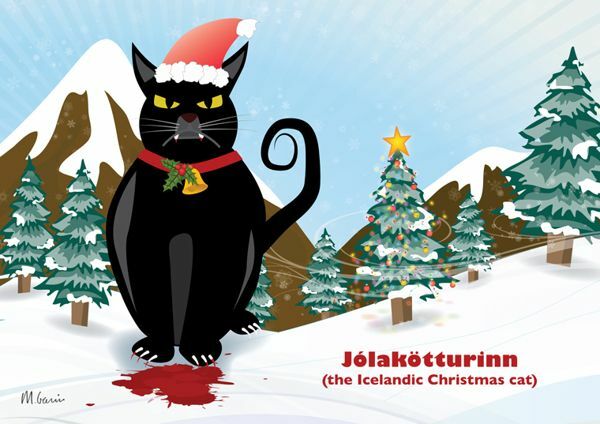 In any case, much like the Krampus, the Yule Cat has long been a Christmas-time enforcer of good behavior, According to Icelandic tradition, anyone who finished their chores before Christmas would get new clothes as a reward. Meanwhile, lazy children who didn’t get their work done would have to face the Jólakötturinn. For starters, the Jólakötturinn is no mere kitten—it towers above the tallest houses. As it prowls about Iceland on Christmas night, the Yule Cat peers in through the windows to see what kids have gotten for presents. If new clothes are among their new possessions, the big cat will move along. But if a child was too lazy to earn their new socks, the Jólakötturinn will eat their dinner, before moving on to the main course: the child herself. Presumably the threat of being eaten by the Jólakötturinn is also meant to inspire generosity in children who don’t have to fret about the Yule Cat, as giving clothes to the less-fortunate would grant them protection from the monstrous feline. But the giant beast isn’t even the only human-eating Christmas monster that Icelanders have the misfortune of having to face every year. There’s also the Jólakötturinn’s owners: the trolls Grýla, Leppalúði and their 13 children, who are collectively known as the “Yule Lads. So if you ever find yourself celebrating Christmas in Iceland, make sure to get some new clothes under the tree—those socks will come in handy when the Yule Cat peers in your window. I live in Europe but I had never heard of the Jólakötturinn (well I live a long way from Island in southern Europe). I had heard of the Yule Lads from the same tradition, but not the cat. The researchers here at the Smithsonian think that the Claus counterpart is the same creature, but just transformed to a different animal form according to what would make sense for that region.